Not your ordinary bracelet. Rugged yet delicate. Matte yet sparkly. This bracelet has so many different elements you can spin it around and look at it for hours. Copper colored links, sweet little freshwater pearl, hints of turquoise, taupe Swarovski crystal, glass beads, Ring O' Links. And more. 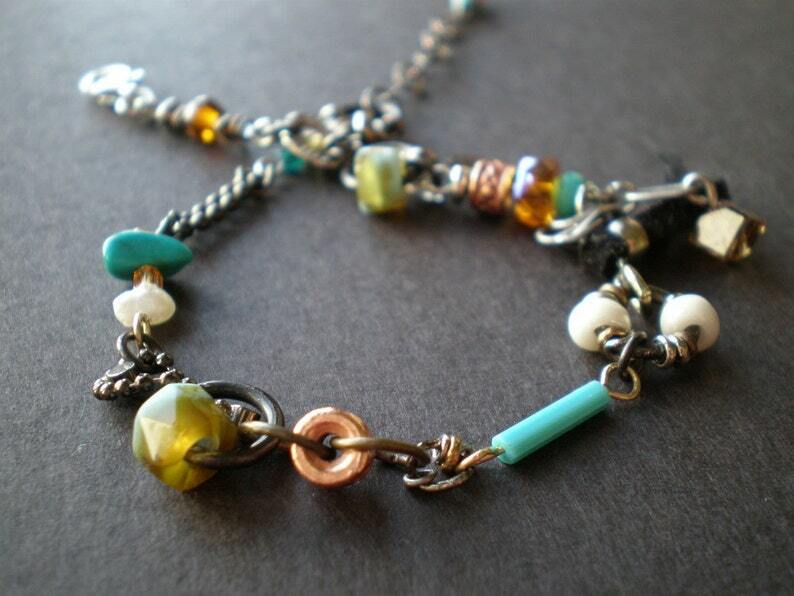 The clasp is sterling and the sterling extender is oxidized. The perfect gift. . . to yourself. This bracelet is made to order. It will not be the one pictured, but a virtual twin of it! The bracelet will be average size (around 6-1/2" ) unless you request otherwise. Click the heart ♥ and save it to your "Favorites"
≜ Questions? Click here and start a conversation with me!